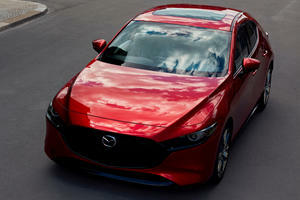 The three-trim Mazda3 range sees one lower spec Sport model with a 155 hp 2.0-liter 4-cylinder powering it followed up with Touring and Grand Touring models that both use the same 185 hp 2.5-liter 4-cylinder engine. The cars can be had with either a 6-speed manual or a 6-speed automatic transmission, both of which drive power to the front wheels. An impressive list of standard features makes the pricing attractive, and available options won’t hurt the budget too much. The Mazda3 5-Door Sport starts at $20,395 with the Touring at $21,890 and the Grand Touring at $24,945 and in all cases available options are still quite affordable. After the last updates to the Mazda range, the cars and SUVs on offer from the automaker all follow the new Kodo “soul of motion” design architecture – and that’s not a bad thing. Angular, striking looks are found across the range and the Mazda3 5-door has to subjectively be one of the best looking of the lot. The Mazda 3 lineup is composed of the Sport, Touring and Grand Touring with two engine and two transmission options available, some great interior tech and spec and a starting price tag of $19,345 to make for a very attractive purchase in this segment. Inside the Mazda3 you’ll find a mix of plastic, brushed aluminum and leather in all the right combinations. The sporty multifunction steering wheel and the power adjusting sports seat can be set to a great driving position that lets you see the road and instrument cluster with ease. The latter sees a tachometer take center stage to inspire the drive, and above that there’s an almost imperceptible screen for the heads up display that looks like it can fold down, but it can’t, trust us. In the center of the dash is the 7-inch screen that heads up the infotainment system, which uses Mazda Connect that has a really good and intuitive operation through either the touch screen of the Commander control in the center console. Five adults will fit comfortably, and trunk space will fit a golf bag or two, but when more space is a must the rear 60/40 folding seats can offer up 47.1 cu-ft. of storage space. The Mazda3 comes with two engine options, both of which supply enough power for a spirited drive although in true Japanese engine fashion you need to get the revs into the upper sections of the range. The Mazda3 handles great thanks to independent suspension all round that works with the G-Vectoring Control technology that adjusts power delivery and shifts weight to make the drive smoother and less taxing on the driver. 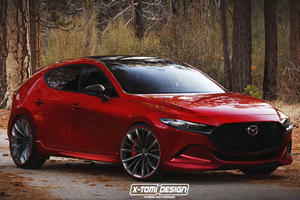 Steering is sharp and precise with very good feedback and the chassis is tight and inspires confidence, enough so that you wish Mazda would hurry up and jump on the turbocharging bandwagon so that more power can be had. The 6-speed manual transmission is also good with purposeful shifts that slot into place as if pulled there, and the 6-speed automatic is equally good. Sport mode allows higher in-gear revs and so you can control when to shift or not. 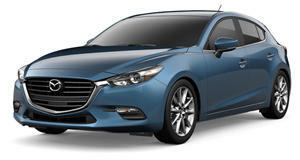 The Mazda3 5-door shares engines with the other 3s, and so there are two options available. The first, in the base Sport trim, is a normally aspirated 2.0-liter with 155 hp and 150 lb-ft of torque available that with the 6-speed manual returns 27 mpg for city driving and 28 mpg with the 6-speed automatic option. The Touring and Grand Touring use the larger 2.5-liter 4-cylinder that’s also normally aspirated and produces 184 hp with 185 lb-ft of torque. 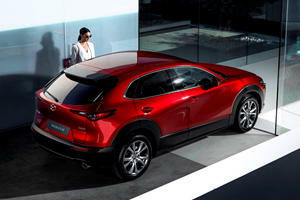 This one returns figures of 26 mpg for the auto and 25 mpg for the manual in a city scenario. It’s capable of a sub-7 second 0-60 mph run and is electronically limited to 132 mph on top. The Mazda3, in all trims, have good standard and optional features that include ABS, electronic brake-force distribution, hill start assist, dynamic stability control, traction control, automated emergency braking as standard, Bluetooth and a rearview camera. You’re also able to option a blind spot monitoring and rear-cross traffic alert function. The infotainment system can be upgraded to include navigation and a powerful Bose 9-speaker surround sound audio system. A must-have is the adaptive cruise control that works very well in the Mazda3 range; it’s part of a package that will cost over $1,500 but it’s worth it, as it also features paddle shifters that make the automatic transmission a lot more fun. The Mazda3 5-door is a great looking hatchback that’s filled with quite a lot of technology and comes in at a great price point. The interior styling and layout is great, as are the materials used as standard, and there’s great space for 5 adults, or a lot of cargo space when needed. The normally aspirated engines on offer are revvy and responsive and with the right drive mode selected can make for some spirited performance, although the manual is better for this. The only real let down for the Mazda3 is it’s underpowered when compared to rival offerings, and for many buyers that can make or break the sale even if you explain that the engineers focused more on the drive and feel of the car than the power.